Welcome to Mabel’s! You’ve never been anywhere quite like this. when we’re hustling through everyday life. and open to the skies above our heads. Taos, New Mexico is a magical place: the earth cool and steady, the sky bluer than you can imagine, the sunlit air sparkling and alive. 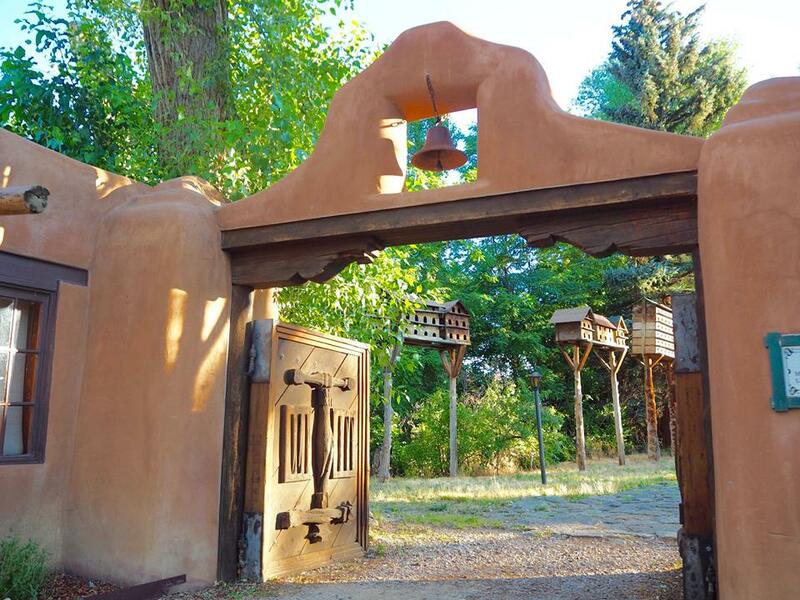 Nestled at the end of a quiet road near the town plaza is Mabel Dodge Luhan's house, a rambling hacienda that served as a vibrant homebase for all sorts of Creatives in the early 20th century. Ansel Adams decided to become a photographer here. Georgia O'Keeffe made her first paintings of New Mexico. Willa Cather, D.H. Lawrence, and Aldous Huxley wrote; Carl Jung pondered; Martha Graham tapped into the electric atmosphere. Today, Mabel's house is an inn and retreat center that continues the tradition of bringing together people who want to be more fully themselves and, as Mabel put it, "escape to reality." This place is beyond charming: welcoming with its adobe construction and quirky interiors, and inspiring with its history and panoramic views. Summer is gorgeous, with bright, warm, sunny days and cool desert evenings and an occasional thunderstorm passing through. We'll spend 7 days and 6 nights at Mabel’s, soaking up the grounded, nurturing, spacious, inspiring energy of this extraordinary place. Mabel’s in the summer is a dream. Here’s a photo of the grounds taken by a retreater a couple summers ago. The spacious and grounding daily schedule of this retreat encourages a profound re-set of your circadian rhythms. Wake up with the sun for coffee/tea and alone time with your journal. Enjoy deeply nurturing, nothing-to-prove daily yoga. Practice mind/body techniques that help you access and heed your body's wisdom. Commune in Mabel's cozy dining space for extraordinarily delicious, healthy, and prepared-with-love daily meals. Enjoy long sleeps through the cool desert nights. Every day, for 8 days: do what feels Good. Under vast New Mexican skies, and in the artists' haven of Taos, your sense of Who You Are and What's Possible will expand and clarify. Since our retreat ends on the Summer Solstice, I’m inspired to create myraid ways for you to connecting your own heavenly body with the ones above us. You’re invited to explore your astrological chart - and to integrate what you discover there - through several sessions dedicated to astrology, coaching, and SoulCollage®. You’ll get to marvel at the heavens when a local astronomer takes us on a stargazing tour with his badass telescope. You’ll get to celebrate the longest day of the year with Solstice evening in the hot springs at Ojo Caliente. The week will be a little witchy, a lot inspiring, and completely, life-changingly extraordinary. I say retreats are for treating yourself like a queen. You have ample freedom to do and not-do whatever you like. Ample encouragement to privilege what’s calling you - alone time or adventures - and feel good about saying Yes to yourself. Mabel's lovely kitchen & dining space. Our spacious, wood-smelling yoga room is even lovelier in person. At her best, Mabel was a visionary badass who lived intensely and artfully and generously invited others to do the same. In this retreat, you too will EnMabel: become more and more confident in both our generosity and our self-assertion. We got more and more comfortable doing what we felt like doing. We spoke our minds, we shared the last cookie, we were courageous adventurers and also luxuriating homebodies. Throughout the retreat, we'll endeavor to do what Mabel's guests have done for almost 100 years: become more fully ourselves, together, by giving each other both space and support. Every guest room at Mabel's is different, and all are sweet and full of character. Single rooms have either a queen or full bed. Shared rooms usually have two twins, sometimes have a queen and a twin. All rooms have en suite bath, and of course you’ll have access to all the house’s lovely common areas, too. Once you register, you’ll be able to give me your top three room choices. They’re first come, first get! If you’re interested in sharing a room, you can either tell us with whom you want to share, or we’ll do our best to find you a roomie. * Summer solstice at Ojo Caliente, including access to marvelous hot springs, a solstice celebration, and an overnight stay. * So many treats. Prepare to be treated like a queen! We begin Saturday evening, June 15, with dinner at Mabel’s, and close the following Saturday morning with breakfast at Ojo Caliente. Fly in to Albuquerque or Santa Fe, then have a beautiful drive to Taos, either by shuttle or rented car. Albuquerque is about 2.5 hours away; Santa Fe a little less than 2 hours. Most folks arrive in New Mexico in the morning, and head to Mabel’s straight away, maybe stopping in Santa Fe for lunch. (Rooms are ready around 3p, though you're welcome to arrive before then. Arrive by 6p for dinner, please!). Since we’re spending our final night at Ojo Caliente, you’ll return to the airport from there . . . which shortens your return trip a little bit. We are happy to connect retreaters interested in sharing a car ride or coordinating a shuttle, so that you can make travel plans together. Includes lodging for eight days, seven nights, all yoga & astrology workshops (plus a copy of your birth chart! ); hot springs access; stargazing adventure; guided hike; 19 meals; all manner of treats and surprises. Includes shared lodging for eight days, seven nights; all yoga & astrology workshops (plus a copy of your birth chart! ); hot springs access; stargazing adventure; guided hike; 19 meals; all manner of treats and surprises. I always have a small fund for partial scholarships. Please fill out the form below to inquire about these. For payment in 4 installments: the first payment is due upon registration, and the following 3 are due over the next 90 days. (If you register on Feb 14, subsequent payments are Mar 14, Apr 14, and May 14). Payments are required to secure your spot and confirm your room choice. My commitment to Mabel's House makes me unable to offer any refunds - though I'm happy to accommodate you finding someone else to take your spot! If you're concerned about this, please consider purchasing travel insurance. It’s very reasonably priced and reassuring.